Bucket list egg dish dishes to start the day from Distinctive Inns of New England. 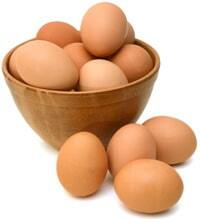 The American Egg Board calls them the incredible edible eggs. There’s even an Incredible edible egg website and Facebook page, featuring none other than the Bacon Brothers. When it comes to egg-celent breakfasts, eggs often take center stage at the Distinctive Inns of New England (DINE). It’s no accident that this group of 12 culinary-focused inns have created a name with the acronym of DINE. And the culinary fun starts each day with a gourmet, beautifully crafted breakfast at each of these inns. This is the final entry in a series of bucket list breakfast ideas from 12 Distinctive Inns of New England innkeepers who specialize in creating the perfect start and ending to each day. The first post in our series focused on Pancakes with Panache, offering up a collection of out-of-the-box pancake variations. The second entry in our bucket list breakfast ideas series focused on wonderful variations of French Toast. In our third article of the bucket list breakfast ideas series, we introduced recipes for muffins, scones and donuts. Now we’ll top off our New England breakfast recipe compendium with wonderful ideas for eggs to jump start a romantic getaway – either at any of the 12 DINE inns or at your own home. To create your own DINE experience at home, try one of these wonderful recipes. Beat egg – salt and pepper to taste. Add to spinach and cook for about 2 minutes. Layer goat cheese and sliced tomatoes on top. Transfer pan to oven and broil on high for 2 minutes. Beat eggs. Add cheeses, butter and mix well. 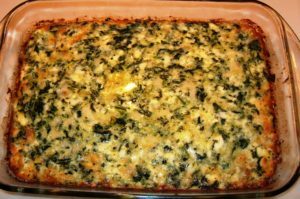 Cook and drain spinach well. Add to cheese mixture. Add nutmeg and hot pepper sauce. Pour into a greased 9 x 13 baking dish and bake at 350’ for 40 minutes. 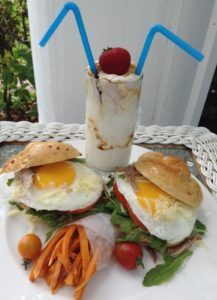 Note: This retro-style breakfast dish for two is a perfect choice to serve on “Throw Back Thursdays”. It’s a fun and nostalgic way for couples to start their day. Fry the sweet potato strips until golden brown. Rest on paper towel. Layer the cheese, tomato, and breakfast meat. Put 6 eggs in a pot. Cover with cold water. Turn eggs on high and set timer for 20 minutes. When done, drain eggs and cool. Peel and halve eggs. Remove yolks to another bowl. Meanwhile, use a different bowl for each color of eggs you want. In the bowl put: 1 cup water; 5 drops of food coloring in the color desired; 1 tsp white vinegar. 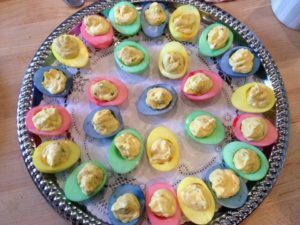 After eggs are cool, soak the whites in the food coloring mixture for 5-10 minutes or until desired shade of color. Remove and dry the now colored egg whites. Filling: combine ½ cup mayonnaise; ½ tsp salt; 1 Tbsp sweet relish; 1 Tbsp Dijon mustard. Place filling inside colored egg whites and place on tray. Sprinkle with paprika or parsley as desired. Note: These were done for Easter, but there is no reason you couldn’t do Red, White and Blue for Memorial Day or 4th of July, red and green for Christmas, or any other color scheme you like. Next time you’re in the mood for a bodacious breakfast, turn to this bucket list breakfast ideas series from your friends at Distinctive Inns of New England. Better yet, plan to enjoy your own bucket list breakfast at any of the 12 Distinctive Inns of New England and leave the cooking and clean up behind. Plan your pampered 2017 getaway at the 12 Distinctive Inns of New England by clicking below on links that will take you directly to each of their websites. 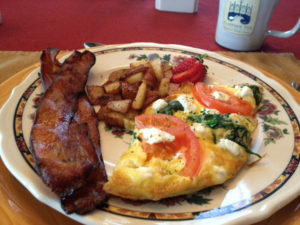 This entry was posted in Camden Maine Stay, Cliffside Inn, culinary travel, Distinctive Inns of New England, Rabbit Hill Inn, Recipe and tagged B&B breakfast recipes, breakfast, breakfast at New England inns, breakfast recipes, breakfast recipes from New England Inns, bucket list breakfast recipes, dyed egg recipe, egg sandwich for two, Frittata recipe, from New England innkeepers, New England B&B recipes, New England inns recipes, retro breakfast recipe, romantic breakfast recipes, romantic breakfasts by DINE Blogger. Bookmark the permalink.